Powers/Abilities: Number One possessed no known superhuman abilities other than his metallic robot form granted him. He had two pairs of arms he used to operate the complex controls of his vessel and giant, bloodred compound eyes. Number One's head was able to survive the destruction of its body. The head could emit a signal that would turn himself and all his robotic underlings to dust within seconds. (Incredible Hulk 1X03 (fb) - BTS) - Number One belonged to an alien race of insectoid robots eager to master the secrets of gamma radiation. Learning of Earth scientist Bruce Banner's advances in that field, they decided to send a number of robots to the planet disguised as humans to monitor his progress. One of these robotic operatives, No. 43, posed as one Doctor Carlston a colleague of Banner. They were working out of a military base and preparing to test the first practical, weaponized usage of Banner's gamma formula. Banner refused to share the formula with anyone until after the test, ignoring Carlston's repeated requests to check his work to make sure there wouldn't be any accidental slip ups. Carlston kept Number One apprised of his progress and the imminent testing of the gamma formula. (Incredible Hulk 1X03 - BTS) - A little while before the test, Number One's fully automatic mothership dropped him off aboard a pod that was his mobile command center. While military fighter jets chased and eventually shot and destroyed the mothership, Number One used his smaller vessel's capabilities to burrow underground to wait for the right moment to strike. Right before the test, Carlston learned that Banner was keeping the formula hidden away in his bungalow elsewhere on the military complex. During the countdown, clueless local teenager Rick Jones decided to use the testing area as a shortcut. Banner raced out to get him to safety, ordering Carlston to terminate the countdown. However, now that he knew where to find the formula, the alien robot did nothing. With Banner gone, he could easily go and look for it at his convenience. Banner and Rick Jones miraculously survived the explosive test (though it had turned Banner into the Hulk). They were taken to the base hospital for observation. Carlston checked to make sure Banner wouldn't be released until the morning, allowing him the time to search his apartment. Carlston informed Number One of his progress and his plans, the robotic leader told his underling he was most pleased. (Incredible Hulk 1X03 - BTS) - While Carlston was searching Banner's apartment, Bruce Banner turned into the Hulk for the first time and broke out of the locked hospital room the military had kept him and Rick Jones in. On his way out, he ran into Betty Ross who was so stunned to see the green goliath she tripped, fell and knocked herself out. Hulk instinctively took her to Banner's place, where he put her on the couch to rest. Then he heard Carlston ransacking the place just as the robot found the formula, hidden inside a table lamp. A fight ensued, with the superbly strong robot putting up a decent fight against the surprised Hulk. 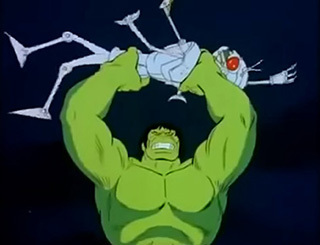 However, by the time Rick Jones and Major Talbot had arrived, Carlston had been revealed as a robot and wound up destroyed at the hands of the Hulk. After this display of force, he turned back into Bruce Banner and wound up getting arrested by the overzealous Talbot. 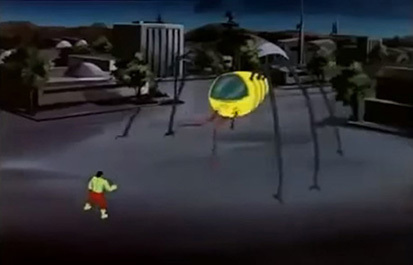 (Incredible Hulk 1X03) - Moments after Banner had been hauled off in a military prison wagon, Number One used his vessel to burrow through the base to the demolished apartment to claim the Gamma formula. Number One faced Betty and Rick, repeatedly asking where the formula was in his shrill voice. He stunned Rick Jones when he refused to cooperate, firing a blast from his ship. This motivated Betty enough to grab the papers dropped by "Carlston" and show them to Number One. He brought her aboard using the ship's grabbers and quickly restrained her behind a forcefield. After checking the formula's authenticity, he planned to leave Earth to return home. However, the military attacked in force. Even though his "crab ship" (as Rick Jones nicknamed the alien vessel) was sufficiently sturdy enough to withstand the missiles launched at it, the ruckus alarmed Banner who got so agitated he turned into the Hulk again. The green behemoth sought to rescue Betty, attacking the ship, breaking in, slamming Number One aside and making sure Ross was safe before returning to finish the alien vessel by smashing three of its six support legs. Number One survived the crash, crawling out of the wreckage but he was grabbed by the Hulk who hurled him away. The impact smashed his robotic body, though his head endured. Still able to act and communicate, Number One activated the "robot destruct mechanism" that caused himself, his ship and presumably all other remaining robots to crumble to dust within seconds. How's that for updating the Hulk's origin story by adding the threat of a metalloid horror from outerspace? Growing up with the 1982 Incredible Hulk cartoon, it helped spawn yours truly's fascination with all things Marvel. 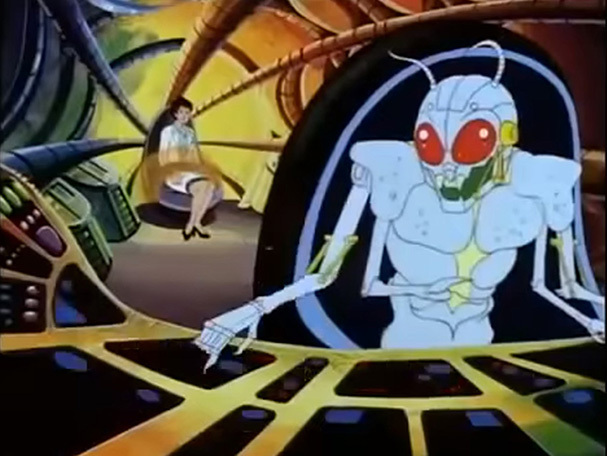 However, the mysterious robot appearing in the opening theme never showed up in the comics. His over the top, high-pitched voice in the actual episode was overdubbed with equally high-pitched electronic warblings for the credits, so imagine my surprise when I reviewed the episode and found he had dialogue after all. So, reason enough to profile the mysterious Number One. And oh boy, if that themesong doesn't give you the feels. 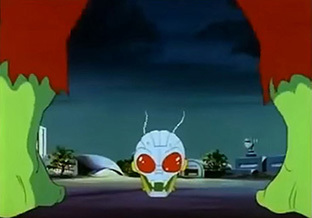 Considering Number One communicated with Number 43 (disguised as Dr. Carlston) it stands to reason there were at least 41 other alien robot insectoid operatives on Earth at the time. Chances are they crumbled to dust when One activated the ever so convenient robot destruct mechanism. Number One's ship was launched from the robotic mothership as a shell like pod durable enough to withstand the rough desert landing and directed missile fire. It moved using 6 extendable legs strong enough to burrow through solid rock, a single leg was even able to briefly push back the Hulk. Described as a "Crab Ship" because of its appearance, the vessel came equipped with laser rays and stun beams. Two equally extendable grabbers mounted beneath the viewport could be guided to grab whatever person or object Number One desired. The inside of the ship consisted of advanced equipment, including a communications array, that Number One operated using his four hands. He could generate restrictive forcefields inside the vessel to hold prisoners. 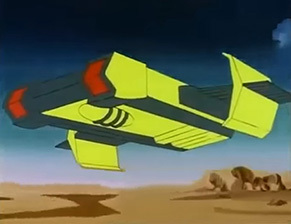 Number One piloted the "Crab Ship" while he was spearheading the retrieval of Bruce Banner's secret Gamma formula. He approached the base his operative No. 43 was working out of undetected by burrowing through the ground, then made his presence known. When Rick Jones refused to tell him where the formula was, Number One used his ship's stun ray on him. In response, Betty Ross held up the formula leading Number One to use one of the ship's "grabbers" to bring her aboard. Ross was restricted by a forcefield while Number One prepared to return home with the formula. The "Crab Ship" proved no match for the military's weapons and explosives, but then the Hulk arrived to free Betty. He was briefly struggling against one of the craft's powerful legs, but soon jumped inside through the viewport. He rescued Betty, smashing Number One's control consoles and then tore off three of the craft's legs causing it to crash and burn.